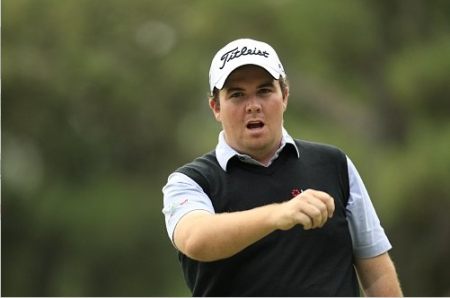 Shane Lowry is having a ball after making the cut on his major debut. But the Clara ace, 22, is lucky it wasn’t a smashing time after he threw his ball to Offaly fans after a tap-in birdie at the 18th for a 73. Delighted with his finish, Lowry gave his throw too much power, overshot the crowd and almost broke the window of St Andrews Golf Club. Safely through on three under par, he beamed: “It’s really satisfying to make the cut here in my first major. He certainly gave his Offaly Army something to cheer about when he threw the ball to them afterwards. The ball flew over the crowd and finished up in the front yard of one of St Andrews snootiest clubs. It ended up in the pocket of one of the Ford family from Ballyfore in Edenderry, who had followed Lowry for all 18 holes on his Open debut. After opening with a 68, Lowry got an early wake up call for his 6.52am tee time but took a while to get going in every sense as wind and rain lashed the early starters. He said: “I set the alarm for 4.45 but didn’t get up until five past five. My plan was to avoid silly mistakes but I made a stupid double on the second. “I just leaked my tee shot down the right and I was in a bush and had to take a drop. But Lowry dug deep to play the next 15 holes in level par before almost chipping in for an eagle at the last. He said: “The weather calmed down a little and I managed to play well enough. Lowry is ranked 88th in the world and knows that a good weekend will make him a certainty to make the top 100 who will tee it up in next month’s US PGA. He said: “Majors are where you want to be, aren’t they? It wasn’t easy out there, I dug deep and I played sensible golf. After a double, it is kind of hard to do that. “It shows how much I’ve matured over the last 12 months. Hopefully I can shoot a couple of good rounds at the weekend. The Offaly ace, 22, blasted a 360-yard “bullet” drive onto the 18th green, burned the hole with a 20 foot eagle chance and tapped in for a four under effort that leaves him in contention. The silhouettes might be similar but Shane Lowry, Graeme McDowell and Darren Clarke cut distinctly different figures as they trooped off the 18th after another gruelling battle with the Old Course. Shane Lowry during the first round of the Open Championship at Muirfield. Picture Eoin Clarke www.golffile.ieShane Lowry confessed he must get back to basics after mishitting his way to a three over 74 at Muirfield. Shane Lowry watches the flight of his three-iron in the second round of the Open at Muirfield. Picture Eoin Clarke www.golffile.ieShane Lowry produced a sensational birdie at the last to make the weekend with a shot to spare and hinted: I may go on the attack.